Little blessings are all around - if you just look. They’re found on long walks, with friends, at school, and especially with family. 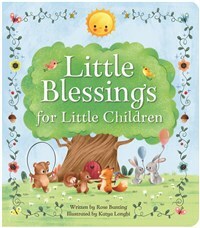 A thoughtful keepsake gift for baptisms, christenings, naming ceremonies, and birthdays. Woodland animal characters are used in place of people, to be any race, gender, or age. Collect all the books in the Love You Always series from Cottage Door Press.